The illness that nearly claimed Danielle Preiser’s life also gave her purpose. She is unstoppable in her pursuit of a world where individuals with special needs are cared for, understood, and celebrated. Now that she’s the healthiest she’s ever been, she’s got big plans for the future. We asked her to share her story — perhaps there’s something there to inspire, teach, and encourage each of us. I am a 23-year-old life enthusiast. I fought for my life on and off for 6.5 years. Though doctors still do not know the cause of my diagnosis, I know the cause of my survival: my brother Jonathan. Johnny is 27-years-old and has Fragile X Syndrome, a genetic disorder similar to Autism. He is my inspiration, my light, and my teacher. I am his advocate, protector, and #1 fan. Wake up with the intention to be a good person. When I was six and Johnny was ten, I first became aware that the world saw my brother differently. As I watched my brother’s bus pull up, I saw two of his classmates making faces at him out the window. Armed with my Cinderella nightgown, fuzzy slippers, and high-pitched voice, I went for it — full force. I ran straight to the bullies, with tunnel vision, a deepened voice, a heavy heart, and a fixated mind. My instinctual protection and immense love for my brother silenced the bullies and rendered change. While previous attempts by authority were futile, my defense worked. 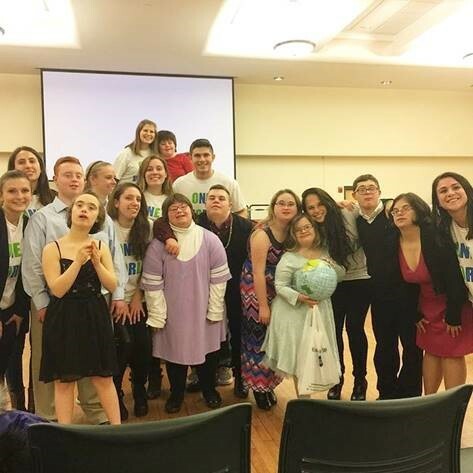 I founded One Special World, an organization that advocates for individuals with special needs. We work to de-stigmatize special needs through volunteerism, peer education, and fundraisers. We primarily volunteer with individuals who have developmental disabilities. We educate on all types of physical, mental, and intellectual needs. Currently, all of our funds go to build a future group home, One Special World. One Special World will house 3–4 residents, a staff member, and a therapy dog. The home will be for male young adults with developmental disabilities who have similar needs. Everyone we know is fighting a battle we know nothing about. I believe that we all have special needs — needs that are unique and special to ourselves and make us individuals. Whether someone has a developmental disability, social anxiety, eating disorder, allergy, or needs a few extra hours of sleep, these are all special needs; these are all human. I think the universality of special needs is paramount. One Special World is more than a home, it’s more than an organization: it’s a movement that brings out the love, light, and heart in everyone. We do this by spreading the message that we all have needs and most of us experience things internally that others cannot see. Most of our needs are invisible. Needs are what make us human, and vulnerability and sharing these needs are what makes human connection. Find purpose and passion in your life’s work. Passion defeats rejection. “No” weeds out the people who don’t want it badly enough. The implementation of One Special World was not easy. After repeatedly being denied, in 2009, I began One Special World as an unfunded trial club in my high school. We now have club at my high school, a Binghamton chapter, and have received 501(c)(3) nonprofit status. Our message and numbers are continuously increasing. All organizations begin as grassroots organizations and with time, love, and care — they flourish. Only begin an organization if your full heart is in it. Love for the cause is what will keep you going. I am currently a Psychology Major with a dual minor in Health & Wellness and Education at Binghamton University. I graduate this spring and am in the process of applying to residential counseling positions and health magazine writing/creative openings. I plan to purse my Doctorate in Psychology or Social Work in a few years. My life goals are to build One Special World and to become a Motivational Speaker while writing a characterization of my life story. I will also explore professorship, counseling, and/or opening a wellness center: Let Health Heal. I have many goals, and thankfully I now also have many years. Regardless of what I do, I want to do good, and a lot of it. I want to help, heal, and inspire people. Become an advocate for yourself and others. Now that I’m healthy, I’m able to do so much more for others. To help others, we need to be whole. Self-care is vital. I have learned that mediation and self-reflection render calmness and growth. Mindset is key. In order to win the battle of life, every survivor must be strong and positive. There are no exceptions. I believe I made it because our work here is not done. Though I am a very social person, I’ve found that alone time is very important. I proudly take myself on mini road trips and adventures. For me, nature heals: it provides a calm I cannot live without. I love spending time by water or in greenery — they offer a quiet peace in which I can hear myself. It’s a great way for me to get to know myself and be in touch with what drives me. J.U.M.P. provides at-risk middle schoolers with the opportunity to attend college for a weekend where they’re paired with a mentor and attend seminars on growth, discover, and inspiration. The goal is to reduce high-school drop out and increase college attendance. I recently served as a JUMP mentor and it showed me how just knowing that you’re important and valued can change the course of your future. As someone who had major health issues, I know that the internal fight of any disease is far harder than the external fight. All the pain, surgeries, doctors, treatments, and tears do not compare to the internal fear, sadness, anger, hope, and questioning. These children deserve their wishes to come true and these fulfilled wishes will light the remainder of their time here. This organization, which I learned about through YNPN-NYC, connects nonprofits with business professionals that donate their time and expertise in areas like finance, IT, marketing, and HR — completely pro bono. For an organization to grow, we need proper logos, websites, and resources and Taproot makes this possible. It’s an organization that’s very much needed and appreciated. Visit One Special World to donate and feel free to reach out to Danielle to learn other ways you can get involved!